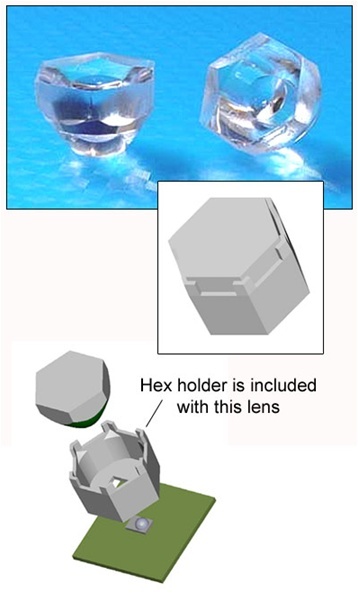 The Polymer Optics 120/121 6° LED collimator lens/holder combination is part of Polymer Modular LED Optics® line of products that are hexagonal shaped to allow maximum packing density and assembly flexibility for Luxeon I Stars and PCB mounted Emitters. Polymer optics are molded from optical grade polycarbonate and offer high light collection efficiencies in a very small form factor. The lens includes a matching hexagonal holder that is mounted directly over the LED using an adhesive. This lens/holder assembly is shipped with the lens inserted into the holder. With care it is possible to remove the lens from the holder.